Tonight we turn our clocks back an hour, ending Daylight Saving Time for 2014. Not all areas of the country take part in this annual manipulation of time, but if you do, we have some ideas on how to squeeze in an hour of romance for your spouse’s pleasure. Bake your spouse’s favorite treat, and read out loud to each other from your favorite author. Put your electronics away, pour your favorite beverage and purpose to talk about your marriage. Topics not allowed in this discussion: children, work, church activities, politics, hot topics that usually lead to conflict. If you’re not sure what to discuss, use these questions to help you. Take a walk holding hands. Start a Thanksgiving-themed jigsaw puzzle, or try this version with a romantic twist. Try out this Mall Date that takes an hour. Let’s make this time of year an annual tradition of romance in our marriages. Think of it as a way to help us both “Fall Back In Love”. 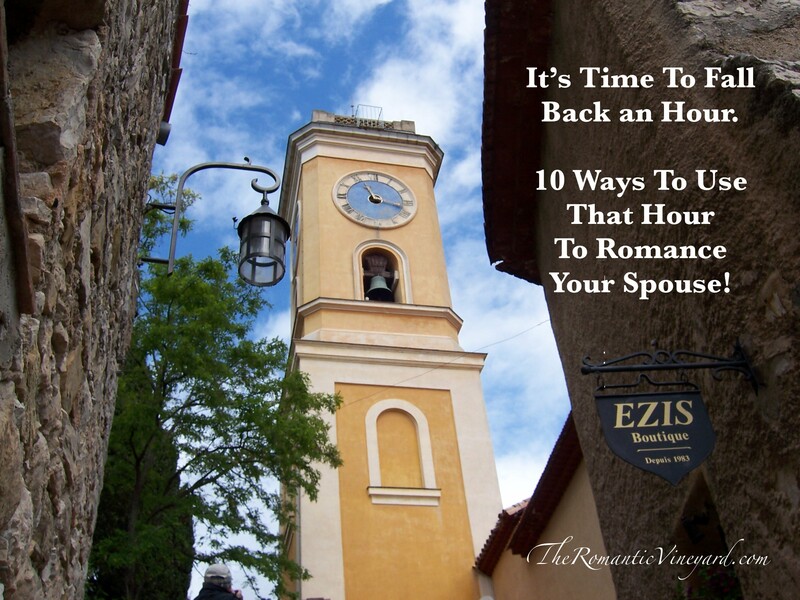 This entry was posted in Christian Marriage, Creative Dates, Date Night Ideas, Fall Date Ideas, Romance in Marriage, romancing your spouse, romantic date nights and tagged An hour of romance, Date Night Ideas, Daylight Saving Time, Daylight Saving Time ends, How to use your extra hour. Bookmark the permalink. Great ideas…but one should be sure that the romantic mood is truly mutual. It wouldn’t work in my marriage – I’m terminal, and my wife has shifted to more of a caregiver role. It engenders a separation that, while painful, is necessary for her well-being. A romantic gesture at this point would be pretty pointless, and possibly hurtful. Andrew, our hearts go out to you both as you’re facing one of the most difficult parts of marriage. She’s demonstrating what true romance looks like–caring for you in sickness. Our prayers are with you.